“Style Me” Dolly has her first free outfit! To complete Dolly’s outfit, here are some precious little shoes. 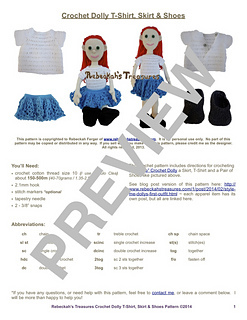 This pattern is also available in a PDF Ebook Bundle together with the dolly skirt and t-shirt (see Dolly’s First Outfit). It’s only $1.50, but you can get it for FREE when you purchase the “Style Me” Crochet Dolly Pattern! The “Style Me” Dolly is 34 cm (13.5”) tall.